(01-23-2019 10:05 AM)HAWKING Wrote: C'mon. Even with way less talent than last year those players understand what is expected of them by Coach Shaver. It's the execution that is lacking. You can't even compare the two teams in that area. Understanding and executing are two very different things, I'd say. Coach Shaver has an identity and scheme. The players still need to fully buy in and run it the way he wants them to. You don't lose to Elon at home if your players are running the scheme properly. Exactly, they are different. You can understand cerebrally but getting a player to execute physically while thinking and in synchronization with 4 other players is execution. So as I said, you can understand what your coach wants from you but still not be able to execute that on the court. I would venture a guess that the Tribe and the Hawks are different in that respect. Quote: For me, it comes down to lack of the type of point guard play this team needs. Much of that may be from thrusting freshmen or sophomores into the role that was played by a savvy senior. A good pg settles things down when the offense is ragged. A pg comfortable in this offense needs to apply pressure on the defense by being an option to penetrate. Not even necessarily to score, but to collapse the defense and get our shooters open looks. There is far too much uncertainty and it shows in our favorite offensive set- the pass the ball around the deep perimeter before heaving up a semi open deep 3. It applies zero pressure on the defense and pretty much wastes our best scoring option in Knight. Guys are so overextended in the perimeter passing lanes waiting on our tentative passes. The relief is dribble penetration and/or back door cuts. Neither of which we look for enough, If I'm Shaver, the ball needs to go to Nate for a touch in the post on every possession. Make a team send double teams. Do something to take the Defense out of their comfort zone. Quote: I have had the same feeling this year with Knight. Too much time spent by Nathan handling the ball at the top of the key. Yes, he's a great passer for a big man and gets some nice assists on the backdoor cuts. But, he also picks up some silly/bad fouls/calls for illegal screens out there. When the perimeter shots aren't falling, as they haven't in several games this year, we need to run the offense through Nathan on the post and/or Justin driving to the hoop. Quote: This team lacks the cohesiveness of last year's team due to us having 6 new players and no overseas trip like last year. Sadly it is drifting towards the pattern of the 2016-17 team so the next two weeks will go a long way in seeing if they will gel as they go on a road trip South. JP needs to decide if he will follow the path of Prewitt or Tarpey in his team play. Knight needs to quit making dumb fouls. The team needs to concentrate better when taking FT as that has cost us at least 3-4 games. We have the right coaches and the talent so it is up to juniors and Rowley to decide their legacy. Quote: When I watch a game, from the coaching staff everything seems negative. So when Milon makes an error, which seems to be more times than not, it seems to just be yelling with never any positive so now the guy will play scared in fear of the screams to come which cycles and cycles until he is a shell of his former self. I think W&M will start to "get it" as play continues this season, will likely be playing their best ball towards the tail end of the regular season and CAA Tournament. (01-23-2019 10:15 AM)Seahawk Nation 08 Wrote: I think W&M will start to "get it" as play continues this season, will likely be playing their best ball towards the tail end of the regular season and CAA Tournament. That's not what we're talking about. You were saying W&M has basically zero identity issues and we do. I think both teams are having an existential crisis at the moment. W&M's is just far less worrisome, because Shaver has put a ton of equity in and we know his system has worked in the past. Shaver is the the 1a/1b coach in this league with Bill Coen. Hey, guys. Looking forward to Thursday night's game. The easy, probably TOO simple answer to a lot of the discussion above is YOUTH. We have 5 freshmen and the two sophs, who are basically all rookies this year. As SN08's excellent preview noted, 4 of the 7 play appreciable minutes per game. We have definitely proved the old adage of extra losses per season based on how many youngsters have to play heavy rotation and rely on. Audige and Owens are definitely very talented, (Audige will put down at least one dunk that you will go "Oh, My." afterwards) but even they tend to make mistakes that cost us wins in close games, like what happened near the end of regulation, against Elon. We knew this was a possibility this season, but we still have big dreams for 2020. Hope we have an entertaining game tomorrow. Bad thing here is too many teams have seemed to "figure it out" or "get it" or however it's put against us. If UNCW can play as they did in the 2nd half against Drexel for 40 minutes, they should win... Mix up the defense and don't let W&M get comfortable. If W&M gets comfortable on offense and dictates the pace of the game it could very well look more like the Delaware game than the Drexel game. Maybe I'm being overly optimistic, but UNCW should win this game. If they lose, it's a bad loss and doesn't bode well for the direction that this season is going in. I believe this team has more fight than that. I'm sticking to my double digit victory guns lol. This is like arguing with my wife. Go Hawks! (01-23-2019 11:19 AM)HAWKING Wrote: This is like arguing with my wife. Go Hawks! I don't see this as an argument, and I don't think our opinions are that far apart on this one. WILMINGTON, North Carolina – The UNCW men's basketball team closes out its first rotation through the Colonial Athletic Association with key home games this week against William & Mary and Elon. The Seahawks (7-13, 3-4) open a lengthy home stand at Trask Coliseum on Thursday, Jan. 24, 2019, with a 7 p.m. tip against longtime foe William & Mary (7-12, 3-4). The two clubs are meeting for the 73rd time in the third longest series on record for the Seahawks. 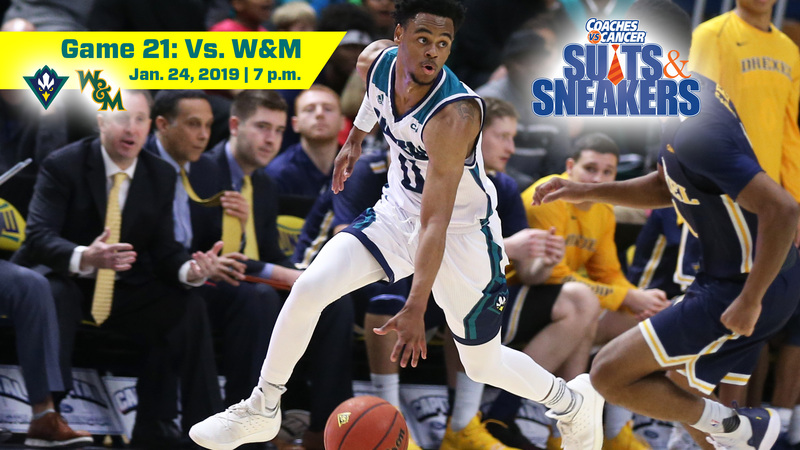 Live Seahawk Digital Network (SDN) coverage of the UNCW-W&M contest begins at 6:45 p.m. with Mike Vaccaro, the "Voice of the Seahawks," and color analyst Marty Feurer on the call. Visit UNCWsports.com/SDN for live video coverage. A radio broadcast of the game may be heard on 95.9 FM "The Breeze" | WKXB HD 2 – 95.9 FM and 99.9 HD2 and live stats are available at UNCWStats.com. "They present a lot of issues," second-year UNCW head coach C.B. McGrath said of the Tribe. "Their assist-turnover ratio is terrific. We have to make sure our guys understand that all five players on defense are going to be guarding outside the arc. Everybody's going to have to be in a stance, active and alert and ready for anything." The matchup is the first of four consecutive home games for the Seahawks as the 2018-19 campaign nears the final month of the regular season. The UNCW-W&M contest features two of the CAA's best big men. UNCW's Devontae Cacok ranks 12th in the league in scoring (15.4 ppg) and first in rebounding (11.7 rpg). W&M's Nathan Knight stands third in scoring (19.4 ppg) and eighth in rebounding (7.8 rpg). In addition, Cacok is first in field goal percentage (.611) and Knight checks in at third (.587). A preseason First-Team All-CAA selection, Cacok has lived up to the billing. In seven conference games, he's averaging a double-double of 18.4 points and 13.7 rebounds, shooting 64.6 percent from the field. He's posted a double-double in every conference appearance this season. On top of that, Cacok, who has moved into fourth on the CAA's all-time rebounding list and continues to be listed on several NCAA stats. He leads the nation in double-doubles, ranks second in total rebounds, holds third in offensive rebounds per game, and stands fifth in rebounds per game. Sophomore guard Ty Gadsden, who sat out three contests due to injury, has averaged 10.7 points. 2.2 rebounds and 3.3 assists since returning to the floor. He's drained 14-of-25 three's during the stretch and leads the CAA in three-point shooting, connecting on 37-of-65 triples for 56.9 percent from deep. The Charlotte, N.C., product has made 13-of-19 treys in the last three contests. THE SERIES: UNCW leads the all-time series by a 43-29 margin, but W&M has taken two straight games, three of the last four and seven of the last 10 matchups. SUITS AND SNEAKERS: It's Coaches vs. Cancer Suits and Sneakers Week (Jan. 22-28, 2019), a nationwide event that unites coaches across the country to raise funds and awareness about the fight against cancer. Both coaching staffs will wear sneakers with their game attire as a visible reminder on the importance of nutrition and physical activity to reduce cancer risk. BLACK OUT: Thursday's contest has been designed as a "Black Out," with fans invited to wear black to the contest. WHAT'S LEFT: The Seahawks have 11 games remaining in the regular season - six at home and five on the road. HOME SWEET HOME: UNCW stands 3-5 at Trask Coliseum this season, beating Allen, East Carolina and Drexel. The Seahawks are 1-2 vs. CAA opponents at home, defeating Drexel and losing to Charleston and Delaware. TOEWS CLIMBS LIST: With 153 helpers, Kai Toews has climbed into a tie for eighth on the single season assist list with Bobby Martin. NEXT UP: Following Thursday's clash with the Tribe, the Seahawks are back at Trask Coliseum on Saturday for a 4 p.m. tip-off against Elon. Your goal should be to combine that with your first half at Hofstra. Thanks Capt Obvious. Any other solid x’s and o’s for the group? If we score more points than W&M, I’m confident we’ll win. (01-23-2019 05:22 PM)Seahawk Nation 08 Wrote: If we score more points than W&M, I’m confident we’ll win. We are 2 point favorites right now. Spread has moved to Hawks by 1 with the over/under at 154. Spread is the same but the over/under bumped up to 154.5.